Vigilante forces have raided the government military installations and stolen tanks, planes and even warships! 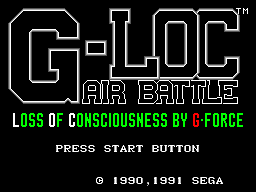 You must pilot your G-Loc fighter jet and battle against the guerrillas! I have no idea why they used this as the story - it sounds a bit silly to me, but this shoot em'up flying game doesn't even need a story. This game is very difficult to review, there are parts of the game that are done very well, and parts that are really badly implemented. When you switch on the game you can choose between 3 difficulty options, trainee, rookie and ace. Obviously trainee is the easiest setting and ace is the most difficult. The game is much shorter on trainee mode than it is on ace mode. I was pleased to see these difficulty settings included. You begin your career as a lieutenant in the air force an you are immediately presented with your flight book - all you have to do at this stage is choose what kind of enemy you want to fight,Tanks,Planes,Warships and special enemies such as War balloons. Each mission is assigned a number of points value, and you have to get so many points before you can take your final mission. The biggest problem when you start the game is the limited amount of control you have over your fighter, you can barely move at all. The only time the game gets interesting is when an enemy plane is behind you and you then see your own plane from behind view and have to try and get the enemy off your tail - this part is actually quite exciting. 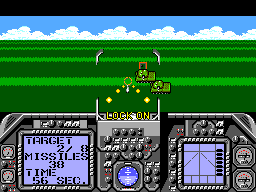 What isn't exciting though is the tank and warship levels where all you have to do is fly in a straight line and shoot. no aiming required. For some reason you cant fight more than one type of enemy on each level. When you complete a mission you are awarded the mission points, from this you can get plane upgrades (although it doesn't seem to make any difference what-so-ever, or you can buy more missiles or repair damage to your plane. The graphics in game are very simplistic, you have the basic cockpit view similar to that of Ace of Aces or the beloved F16 Fighter, the only time you actually see your own plane is when you get an enemy behind you. There is nothing really special to look at in this game at all. The music is ok, what little there is of it - there are only 4 music tracks in the game - one for each type of enemy you will face. The missile and gunfire sounds are OK, but again - average. The sound that annoys me most is the sound when you or the end boss or the war balloon gets shot down - its all the same and it sounds like a steam train coming into station. The controls are the worst part of this game, they totally ruin what ever fun there could have been - although the plane movement is so unresponsive its unbelievable, you can complete mission by not even touching the D-Pad at times. The main menu did give you the option of reversing the vertical controls - but this is worthless in my opinion. 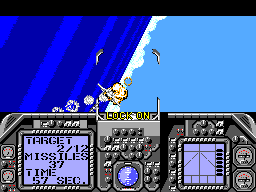 Although I haven't really had much good to say about this game, I have to admit I did play it a considerable amount when I first got it back in ' 91 - working up the ranks of the air force can be fun and I do like the dogfight parts. Its worth playing on Ace difficulty level just so you get more of these. I would say that if you play it though on rookie level then you will want to complete the Ace level also. A game that could have been so much fun is ruined by really dodgy controls - I'm sure there could have been something done about this before the games release and we would have a much better title to play today. If you like arcade flight simulations I would recommend Afterburner over this, but it can be worth a play if your a bit bored.